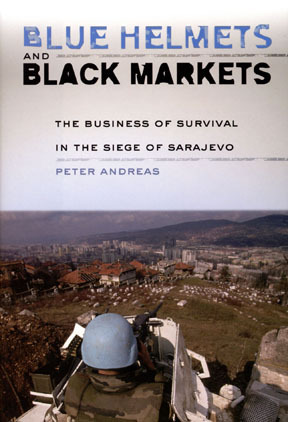 Peter Andreas ’87, Blue Helmets and Black Markets, The Business of Survival in the Siege of Sarajevo, Cornell University Press, 2008. Andreas could not have picked a more important event. The Bosnian fighting was the first outbreak of war in Europe since World War II. Symbolizing the bloody ethnic conflicts and “ethnic cleansing” that have come to dominate our news and shape foreign policy in the last two decades, it became a test case for international humanitarian intervention under United Nations (U.N.) auspices—the “Blue Helmets.” Without massive intervention, Sarajevo would have fallen. The U.N. presence bought the city three years, facilitating the internationally monitored settlement that still holds today. But behind the scenes, is a story of crime and corruption in which all the actors participated—the Serb besiegers, the criminal elements who became soldiers and mafioso on the front lines of the Bosnian defenders, the city’s political elite, the U.N. Blue Helmets, and even international aid workers and reporters. Andreas probes the logic behind the corruption and the purposes it served. The people of Sarajevo could not have withstood the siege without arms, medicines, and food smuggled in through the black market. But the corruption prolonged the siege by strengthening both sides—the Serb besiegers and the Bosnian defenders. The book reveals a war system in which each of the parties had an interest in perpetuating the very conflict they wanted to win. For example, the U.N. had to bargain with the Serbs in order to move supply convoys through Serb-held territory and protect the airport from Serb attack. But allowing humanitarian assistance to flow enabled Serbs to skim off 25 percent of the supplies. And because the Serbs could cut the supply lines at any time, the mere threat of a cutoff became a bargaining chip. The deal the Serbs made with the U.N. and aid agencies effectively lined up these international organizations on the side of the Serbs in opposing efforts—in the U.S. Congress, for example—to lift the embargo on arms shipments to Sarajevo’s defenders, who badly wanted heavy weapons to break the siege. This impasse makes sense only if you understand that one major purpose of humanitarian aid was to prevent the displacement of additional refugees, especially to other parts of Europe. Ending the arms embargo might have broken the siege, risking a wider war and exacerbating the refugee situation. Thus, the Serbs could enlist the U.N. forces as allies in preventing a legal re-arming of the Bosnian army in Sarajevo—all while a black market in small arms (that the U.N. also enabled) allowed Bosnian forces to hold on. Andreas unravels the twisted logic of this war, weaving a story that is as clear as it is fascinating. Through sophisticated explanation and analysis, he shows how short-term interests—economic profit, increases in political power, day-to-day survival, and protecting the humanitarian mission—created a systemic consequence that no individual actor wanted: prolonging the siege. In fact, it even helped delay direct military intervention by Western forces because the Western powers could deflect popular pressure for intervention by promising more aid. Blue Helmets is enriched by a talent not many academics share: Andreas joins compelling, well-written stories with sophisticated insights about the hidden structures that make things work. He shows how seemingly scattered pieces are connected by unintended consequences. For example, to get the Serbs to stop firing on the Sarajevo airport, U.N. forces agree to patrol the airport grounds preventing the residents they are protecting from crossing the airport to escape the city or smuggling in goods. In response, the Bosnian forces dig a “secret” tunnel under the airport to allow safe passage. When the tunnel is finished, the U.N. forces claim that the ground beneath the airport is not part of the airport—and the deal with the Serbs. They refuse to close it, and their presence near the tunnel entrance helps protect travelers and smugglers from Serb artillery fire. Blue Helmets recognizes that humanitarian intervention has become a major tool in conflict resolution, but that it almost inevitably becomes enmeshed in criminal networks and black markets. Brief comparisons to other sieges and humanitarian interventions—Fallujah in 2004 for example—underline Andreas’ point. The way these interventions are carried out, their trajectories, and even their possibilities for success, are shaped by symbiotic relationships that develop between the interveners and the underworld. If, as Andreas implies, there is no way to avoid such problems, understanding their dynamics and thinking about how they might be managed will need to be a central part of any future humanitarian effort. 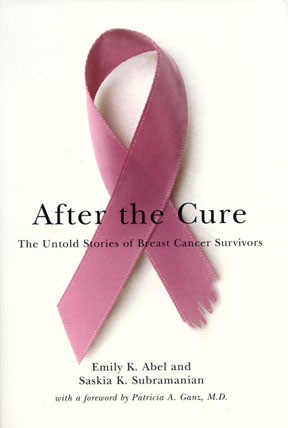 Emily Abel ’64 and Saskia Subramanian, After the Cure: The Untold Stories of Breast Cancer Survivors, New York University Press, 2008. Survivors tell their stories of life after chemotherapy and the complicated, often bittersweet realities of life after the cure. John Brooks ’48 D, No Fixed Address, John Irwin Books, 2008. The late journalist, Washington correspondent, and Georgetown professor depicts the America of his youth—from the Depression, through World War II, to the beginning of the nation’s postwar transformation in Chicago, Southern California, and New York City. Howard Clymer ’42, Conejito: Opening the West, Random NPC LLC, 2008. In this novel, a young teen loses his family in a violent attack on their wagon on the Oregon Trail. The young boy, nicknamed Conejito (little rabbit) as a child, is determined to continue along the trail, and, in doing so, proves to be more like a mountain lion than a rabbit. Jeremy Day-O’Connell ’93, Pentatonicism from the Eighteenth Century to Debussy, University of Rochester Press, 2007. This work offers the first comprehensive account of a widely recognized aspect of music history: the increasing use of pentatonic (“black-key scale”) techniques in 19th-century Western art-music. 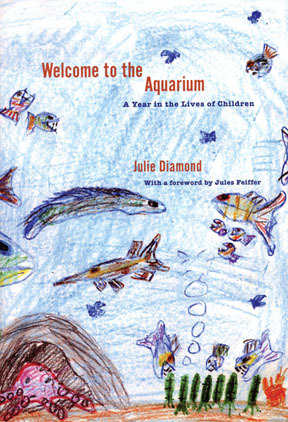 Julie Diamond ’65, Welcome to the Aquarium: A Year in the Lives of Children, The New Press, 2008. Guiding the reader through the details of kindergarten life—such as organization, curriculum, and relationships that define the way a group of kindergartners becomes a class with a distinct personality and culture—veteran educator Diamond lays out the logic behind the routines and rituals children need to thrive. 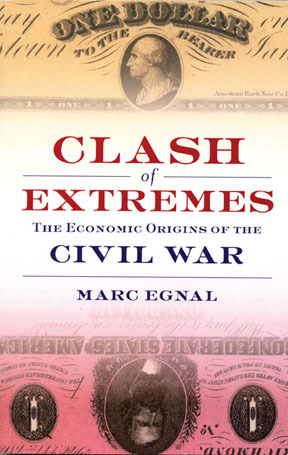 Marc Egnal ’65, Clash of Extremes: The Economic Origins of the Civil War, Hill and Wang, 2009. Challenging the orthodoxy that the American Civil War began for moral reasons, the author contends that the conflict was due primarily to the evolution of the Northern and Southern economies. Helene Smith Ferranti ’54, Sailing to Antarctica, Back Channel Press, 2008. In 1995, the author and one other shipmate set sail from Maine on what became a six-year voyage that included two Atlantic crossings, ports of call in Europe, and a circumnavigation of South America. Covering a five-month segment of their journey—largely in Argentina—the author writes from the perspective of a traveler as well as a sailor, reflecting an interest in the region’s flora and fauna as well as its historical and cultural background and thereby creating a work that comprises much more than simply a nautical adventure. Michele Ruth Gamburd ’87, Breaking the Ashes: The Culture of Illicit Liquor in Sri Lanka, Cornell University Press, 2008. 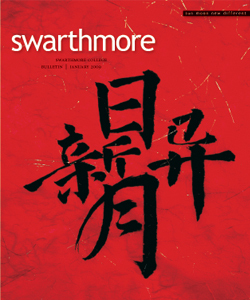 In this work, whose title refers to a Sri Lankan drinker’s comparison between the warming power of the first shot of kasippu, the local moonshine, and the rekindled heat of a kitchen fire, the author explores the changing role of alcohol—despite Buddhist prohibitions—in areas of the world to which globalization has brought poverty. Stephen Henighan ’84, A Report on the Afterlife of Culture, Biblioasis, 2008. One of Canada’s most provocative writers ranges across continents, centuries, and linguistic traditions to examine how literary culture and our perception of history are changing as the world grows smaller. Karen (Rosenberg) Hilsberg ’85 (editor and illustrator), Be Like a Tree: Zen Talks by Thích Phu’ó’c Tinh, Jasmine Roots Press, 2008. Available in English for the first time, the teachings of the Zen Master, rendered in direct speech and poetry, speak to the everyday dilemmas of being human in the 21st century. John Krinsky ’91, Free Labor: Workfare and the Contested Language of Neoliberalism, University of Chicago Press, 2008. The author analyzes the politics of workfare—the practice of making welfare recipients work as a condition of receiving their checks, thus compensating the public for the support they receive—in New York City in the 1990s under Mayor Rudolph Giuliani. Peter Latham ’62, Patricia Horan Latham ’63, and Myrna Mandlawitz, Special Education Law, Pearson Education, Inc., 2008. This work presents IDEA (Individuals with Disabilities Education Act), other pertinent federal laws, and federal cases in a clear, well-organized manner to help educators understand and apply their knowledge in concrete situations. 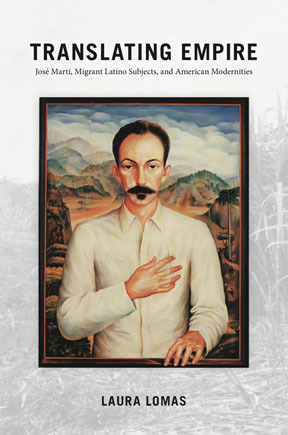 Laura Lomas ’89, Translating Empire: José Martí, Migrant Latino Subjects and American Modernities, Duke University Press, 2008. The author reveals how late 19th-century Latino migrant workers developed a prescient critique of U.S. imperialism: a critique that prefigures many of the concerns—about empire, race, and postcolonial subjectivity—animating American studies today. Elizabeth “Betita” Martinez ’46, (editor) 500 Years of Chicana Women’s History, Rutgers University Press, 2008. The author’s sixth book, whose second printing occurred after only four months, offers a vivid pictorial account of struggle and survival, resilience and achievement, discrimination and identity. It’s a powerful antidote to the deficit of Chicano and Chicana history in most history books. Neil Raphel ’73, Janis Raye, and Adrienne Raphel, Business Success in Tough Times, Raphel Publishing, 2008. 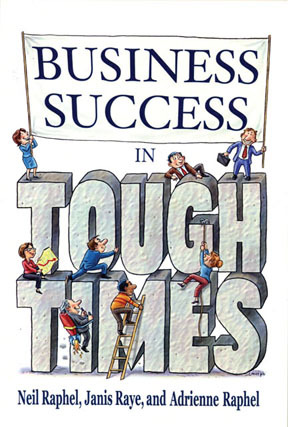 Illustrating nine characteristics of business success, this book tells the stories of businesspeople who faced tough times but survived and thrived. Darius Rejali ’81, Torture and Democracy, Princeton University Press, 2007. In recognition of its scholarship and capacity to influence policy or bring about change in human rights conventions, this book received the 2007 Human Rights Book of the Year Award from the American Political Science Association. 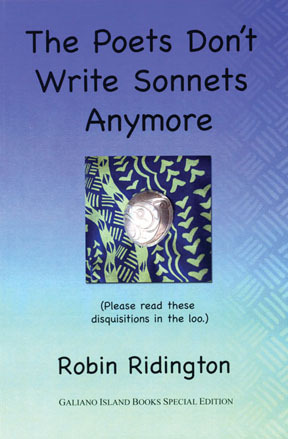 Robin Ridington ’62, The Poets Don’t Write Sonnets Anymore, Plume of Cockatoo Press, 2008. In this collection of sonnets and narratives, which were compiled over the past five decades and containing a section of work from the author’s Swarthmore years, prose passages contextualize the poetry but also stand as essays in their own right as well. Robin Ridington ’62 and Jillian Ridington, When You Sing It Now, Just Like New: First Nations Poetics, Voices, and Representations, University of Nebraska Press, 2006. This collection of essays about stories—the hearing, sharing, recording of, and sometimes becoming characters in them—is the result of the Ridingtons’ decades of work with the Athapaskan-speaking Dane-zaa people of Canada’s Peace River area. Diana Wickes Roose ’70, Teach Us to Live: Stories from Hiroshima and Nagasaki, Intentional Productions, 2007. These stories about the resilience of the human spirit, told by survivors of Hiroshima and Nagasaki, aim to encourage readers to learn from them and help shape the world with new hope for peace and understanding. Robert Roper ’68, Now the Drum of War: Walt Whitman and His Brothers in the Civil War, Walker Publishing Company Inc., 2008. Drawing upon letters exchanged between Walt Whitman and other family members during the Civil War as well as other documentation, this book chronicles the experience of an archetypical American family enduring its own crisis alongside that of the nation. Daren Simkin and Daniel Simkin ’01 (illustrator), The Traveler, Farrar, Straus, and Giroux/Starbucks Entertainment, 2008. This fable for readers of all ages tells the story of a little boy who packs up all his time to go looking for something better to spend it on, only to realize, after traveling the world, that what he sought was to be found back at home. Elizabeth Varon ’85, Disunion: The Coming of the American Civil War, 1789-1859, The University of North Carolina Press, 2008. In this reinterpretation of the origins of the Civil War, the author blends political history with intellectual and cultural history to show how Americans, as far back as the earliest days of the republic, agonized and strategized over disunion. 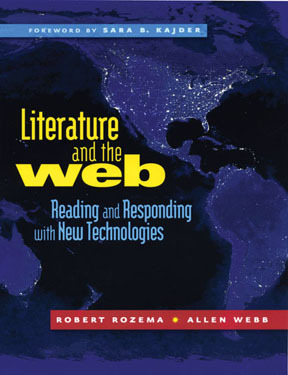 Robert Rozema and Allen Webb ’79, Literature and the Web: Reading and Responding with New Technologies, Heinemann, 2008. Authored by two teachers, this book is a thoughtful, nuts-and-bolts guide for any English teacher looking for effective tools to boost readers’ engagement and improve their responses to literature. 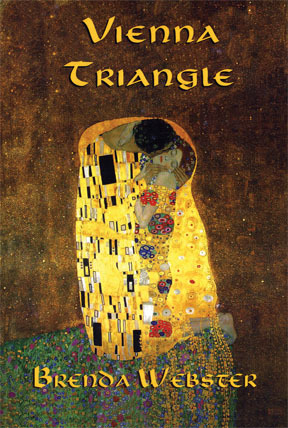 Brenda Webster ’58, Vienna Triangle, Wings Press, 2009. Born into the world of prominent New York Freudians in the middle of the last century, the author weaves a story of historical detection that penetrates the closed world of psychoanalysis.